That’s not a word you hear everyday. Many of you won’t even know it’s meaning. But, what if I say CPU Booster? Yeah, now you get an idea what overclocking is. Overclocking is a way of increasing your CPU’s limit and pushing it more further to deliver the best performance. It not only increases your performance but helps you in gaming and smoothens your desktop experience. Many of the people address it with Overclocking RAM, but actually it is known as Overclocking CPU or you can say CPU Booster. For your information, overclocking is a very sophisticated topic but here in this article, we’ll explain it the easiest way possible. As I already said “Overclocking is a process which requires full concentration.”. But, for your convenience, we won’t go into the technical details circling around voltage and electricity. Overclocking means to extend your CPU’s limits so that it delivers more performance than it was actually designed for. For example, if your CPU works at 2.80GHz, overclocking will help it to achieve 3.00GHz. Overclocking will ruin your CPU’s warranty. It can also damage your hard drive, RAM, and other components if not done the right way. Moderate overclocking is OK, but Extreme will cost you your system’s life. Overclocking helps your CPU to work harder. And you know, when you work hard, you sweat a lot. Overclocking will boost your CPU’s performance but it will also generate thermal energy, simply put, HEAT. So, be sure you have a good cooling system before you even try to overclock RAM. Now, it’s the time for overclocking your CPU. Follow the steps given below. Almost all CPU’s have the same settings but, if you don’t find the same, contact us using the comment section. Press the DELETE key to access BIOS menu. Open the advanced tab (if present) and select the Advanced Frequency Settings. 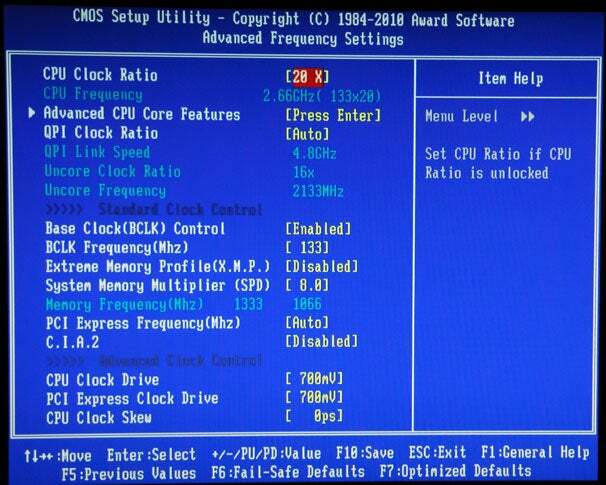 We have to tweak 3 settings: CPU clock ratio, BCLK frequency and the System Memory Multiplier. Change the values of the parameters according to your wish. (Don’t increase to much extent or you’ll damage your system. Just a couple of high-ups are enough). Press F10 to save and reboot your system. Congrats! You have finally overclocked your CPU. So, you learned a quick way to use CPU Booster. Praise your system’s performance and also help others overclock RAM. Feel free to ask any questions related to CPU Booster and How to overclock RAM and you can send us your content and get featured here.